Atheneul Roman or Romanian Athenaeum is a world-renowned concert hall, located in the heart of the Romanian capital Bucharest. For the city as a whole and for the Romanian identity Roman Athenaeum is celebrated as a cultural symbol # 1. It houses Philharmonic "George Enescu" and every year beyond its white walls comprises an international music festival, named after this most important composer for the Romanians. In 2007 Romanian Athenaeum included in the list of European cultural heritage as a major monument of the Romanian nation. Romanian Athenaeum is distinguished by its ornate, domed, oval building as the main concert hall of Bucharest. 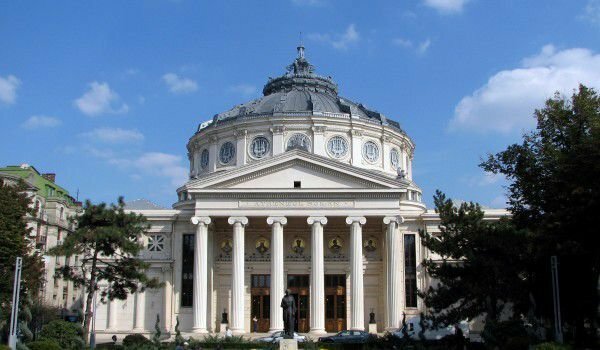 Built over 120 years ago (1886-1888 year), Romanian Athenaeum has managed to become the spiritual and architectural landmark of the whole nation, not just the capital. The building is the brainchild of French architect Albert Galleron. Athenaeum was built in non-classical style with a few little romantic touches. Little known is that Romanian Athenaeum was built with funds collected from the special edition of the state lottery. To be hoarded, there were issued 500 000 tickets, worth 1 Lei each. Today the campaign slogan "Give 1 lei for Athenaeum" is remembered well. For this purpose, the scientist played a major role in natural sciences was Constantin Esarcu, which evokes the Romanian identity for the construction of this cultural symbol of Romanians. Constantine Esarcu together with his comrades founded in 1865 at the Romanian Athenaeum Cultural Society. Soon after its construction, Romanian Athenaeum turns into the cultural center, but also a place where some of the most significant events of Romanian history happen. On December 29, 1919 in the Athenaeum is a conference for Romanian officials who voted to ratify the unification of Bessarabia, Transylvania and Bukovina with the Romanian Old Kingdom, resulting in what appears to be Greater Romania. In 1992 Romanian Athenaeum was undergoing a complete restoration, which saves it from destruction. The front has a small beautiful place, where you can see a statue of Romanian poet Mihai Eminescu. Inside the Athenaeum, on the ground floor, is located an ornate conference room, which is greater than that which is above. The hall has 600 seats + 52 more located in lounges. Extremely beautiful and remarkable is the mural that adorns the oval wall of the concert hall. It is 75 cm long and 3 meters wide and is crafted and decorated with art "al fresco". It depicts the most important moments of Romanian history, starting with the conquest of Dacia by the Roman emperor Trajan, leading to the formation of Greater Romania in 1918.